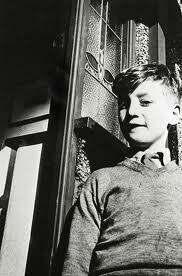 John as a boy. . Wallpaper and background images in the John Lennon club. This John Lennon photo might contain 식당, 거리, 도시 현장, 도시의 설정, 도시 장면, 도시 설정, 도시 거리, 도시 장면 설정, 회전문, and 리볼버.